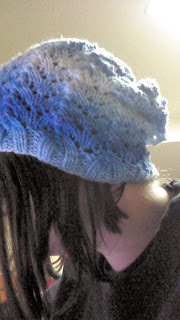 This is a knit hat that you will love to work up. I made it in about an evening and it's so comfy and perfectly slouchy that you'll want to wear it every day. I made mine in this lovely indie dyed yarn that I obtained at Stitches Midwest. It was a sport weight yarn and it was perfect for this pattern. I think if you were to use a worsted weight yarn, it would be too thick to show off the lovely lace pattern. I would also love to do this in a fuzzy lightweight yarn because I think it would be heavenly! I highly recommend this pattern to anyone who would like to try their hand at knitting a hat!! !